We share 98% of our DNA with the Lowland Gorilla. Can we say that we are fairly close on the evolutionary tree? Among the features that we have in common are opposable thumbs and finger nails. Finger nails? Finger nails! Think about it! Finger nails grow… all the time! 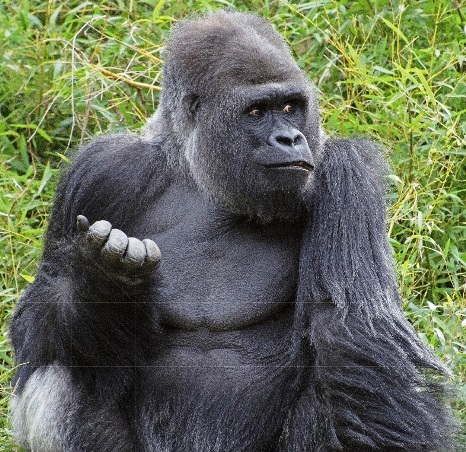 Do you think gorillas in the wild have nail clippers or emery boards? Perhaps they are inveterate nail biters? Well… it turns out that within a gorilla troop there is one individual that is designated as a “manicurist”. This falls in line with the cooperative “grooming” that is very much a part of primate behavior. The gorilla manicurist uses a small rough-edged rock (perhaps a stick) to pare back the length of nails. What is not known is whether the manicurist is role specific to a single gorilla in the troop, or whether the role is performed on a rotational basis within the troop. n.b. In the wild, lowland gorillas use tree sap as a cure for painful in-grown toe nails. There is much that we can learn from our primate cousins!